Charlie’s Pride famous Pastrami is the hit of any deli counter. Piled high on rye, it makes the king of sandwiches. Using quality cuts of beef, Charlie’s Pride blends a variety of spices including peppercorns, garlic and coriander to season its Pastrami to perfection. Whether traditional European or authentic East Coast style, this Pastrami will satisfy the most finicky deli gourmet. And the majority of our Pastrami is 95% fat free. You can feel confident that you have chosen the world’s best Pastrami. Remember - It's Charlie’s Pride! 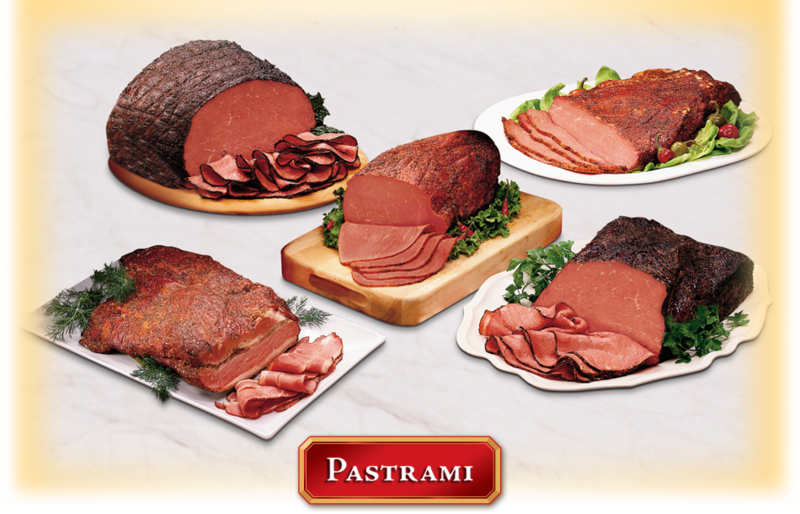 All of our Pastrami items have 0g Trans Fat and No Added MSG. Lean cut. Great for sandwiches. Serve hot or cold. Available in back-to-beginning weight, with a 10% or 15% solution, or with isolated soy protein added. Sold whole (8-12 lbs) and deli-faced (4-6 lbs). Can be ordered with a Western rub. Available in back-to-beginning weight, with a 10% or 15% solution, or with isolated soy protein added. Sold whole (4-8 lbs), or in quarter-piece chubs (2‑3 lbs). Lean cut, ideal for slicing programs and sandwich making. Serve hot or cold. Available in back-to-beginning weight, with a 10% or 15% solution, or with isolated soy protein added. Sold whole (8-12 lbs), deli-faced (4-6 lbs), or in quarter-piece chubs (2‑3 lbs). Available in back-to-beginning weight, with a 10% or 15% solution, or with isolated soy protein added. Sold whole (8-12 lbs), deli-faced (4-6 lbs) or in quarter-piece chubs (2‑3 lbs). Most flavorful and tender. Great for Jewish style delis. Primarily served warm. Available in back-to-beginning weight, with a 10% or 15% solution, or with isolated soy protein added. Sold whole (8‑12 lbs). The traditional deli item. Best served stacked high on rye bread with mustard. Must be served warm and steamy. Available in back-to-beginning weight, or with isolated soy protein added. Sold in 1 or 2 piece (4-6 lbs ea.) packs or in bulk.